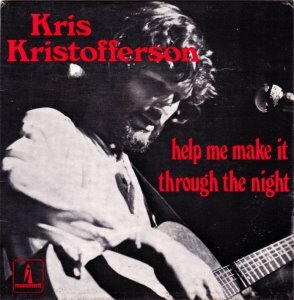 Kristofferson said that he got the inspiration for the song from an Esquire magazine interview with Frank Sinatra. When asked what he believed in, Frank replied, "Booze, broads, or a bible...whatever helps me make it through the night." During his time as a struggling songwriter, Kristofferson wrote the song while staying with Dottie West and her husband, Bill, at their home on Shy's Hill Road in Nashville's Green Hills neighborhood. When he offered Dottie the song, she originally claimed it was "too suggestive" for her. Eventually, she would record it before the year was out, and it is included on her album Careless Hands. However, by then, several others had recorded and released versions of it, some garnering great success. Later on, West said that not recording it when it was originally offered to her was one of the greatest regrets of her career.